Eileen and Callaghan, both 29 years old, met during a mutual friend’s birthday dinner at King’s Bowling in Dedham. 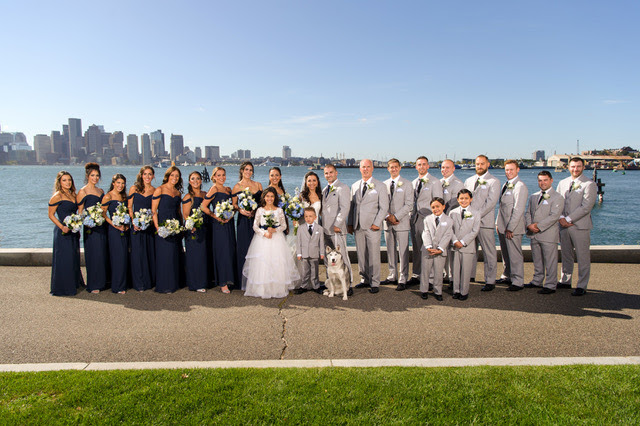 The couple’s venue was right on the water, their color scheme of navy, silver and white was a perfect match which was complimented by the backdrop of boston harbor and the skyline. The bridal party of nine, wore off the shoulder navy dresses and carried bouquets of blue hydrangeas and white roses. Timeless and romantic was the theme which was carried throughout. Right after their first dance the couple broke into a surprise Salsa Dance! No one was expecting it. It was a great way to kick off the celebration.